Looking for gift ideas for men who love a classic wet shave? 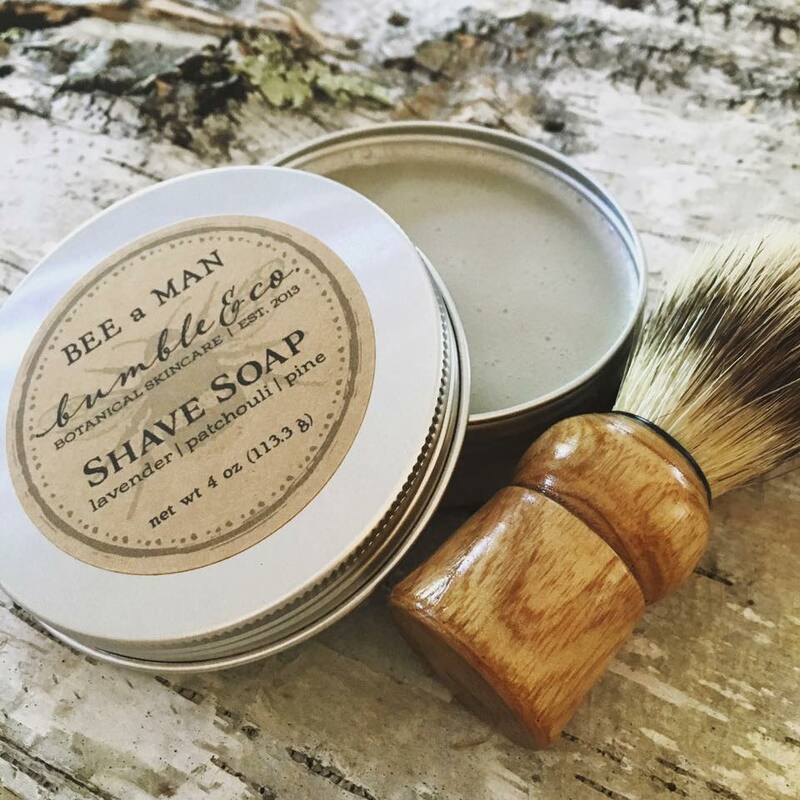 Browse our BEE a MAN line of artisan shaving soaps, aftershave balm and more. 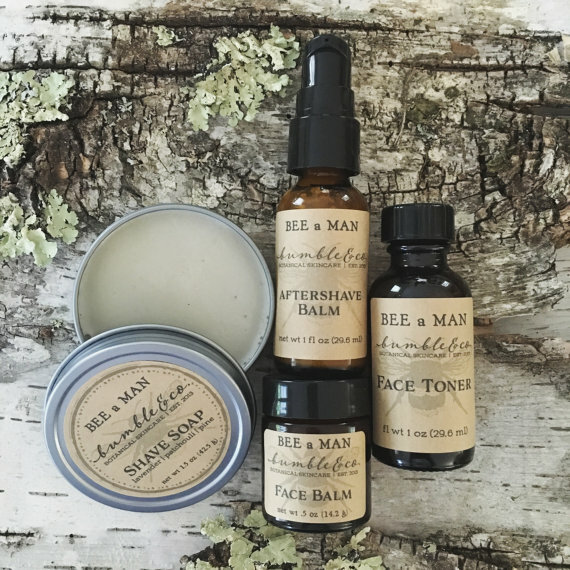 All of our grooming goods + skincare products are made in small batches from our studio in the heart of New England, using only the finest of natural + skin-loving ingredients. Need Help Choosing Shaving gifts? 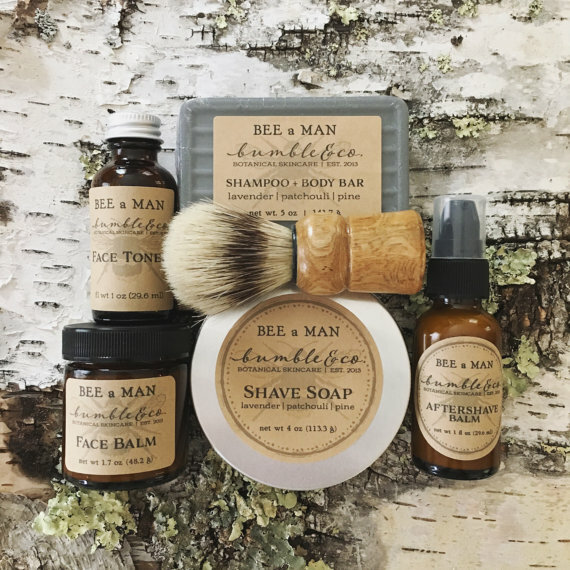 If you need a bit of advice in choosing the perfect Bumble & Co. gift for the man in your life, do not hesitate to get in touch ….. we are happy to help guide you through the products that are sure to please any & all of the men you love! Remember – shipping is FREE on orders over $75. While you’re here, why not check out our other categories of botanical skincare for men + women. You’ll find many more gift ideas for the special people on your Christmas list! Is dad a man on the go? 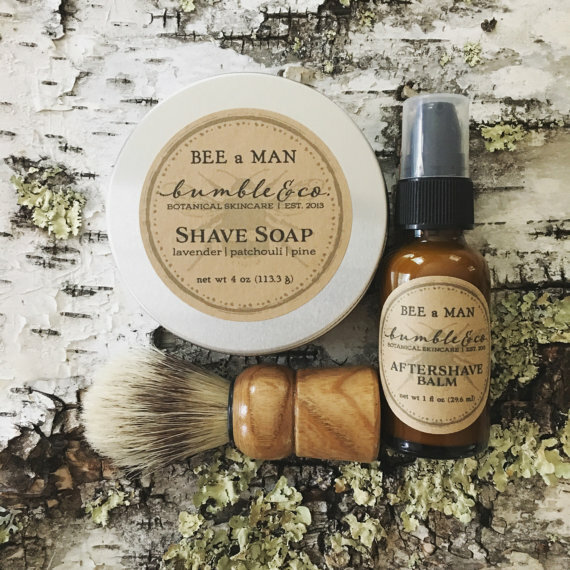 This kit contains travel sized versions of our shave soap and aftershave balm, plus face toner and face balm …. Handsomely packaged and ready for gift giving. All of our most beloved men's products all wrapped up in one manly package. Serious skincare luxury for that special well-groomed man. 100% natural ingredients to keep dad's whiskers groomed + gorgeous! 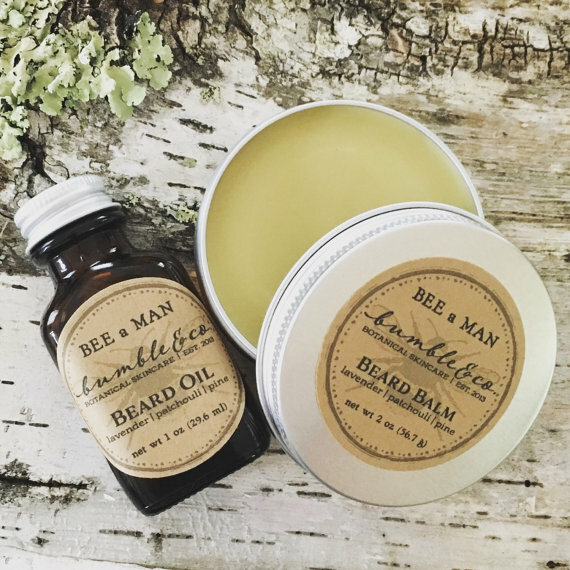 This two-piece set contains a manly beard balm + beard oil. The perfect gift for your favorite furry faced fellow. 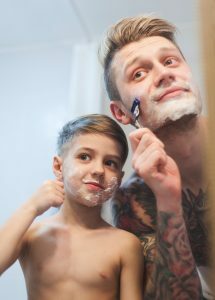 Is dad inked? 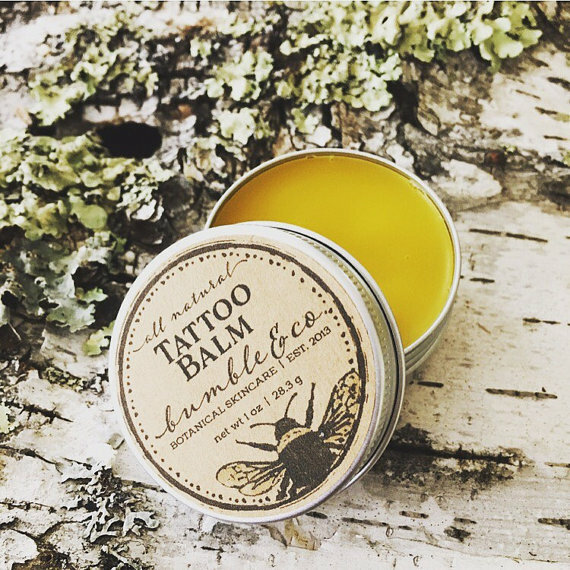 Help keep those tattoos looking fresh + vibrant with our all natural tattoo balm – containing skin-loving botanically infused oils to help moisturize + protect his prized skin art. Ideal for the most sensitive skin. This light yet luscious aftershave balm soothes + cools skin while leaving a soft lingering fragrance which is perfect for men of all ages + skin types and a great finish to a great wet shave! 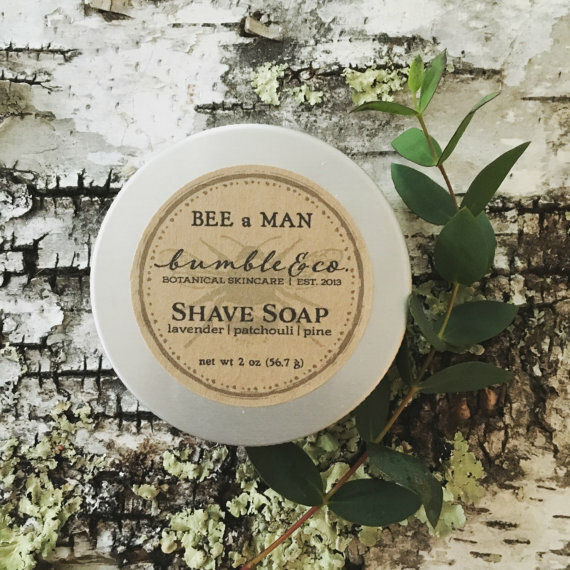 This rich + emollient handcrafted shave soap makes for a natural silky lather and a smooth wet shave, giving great razor glide without irritation .... leaving skin soft + moisturized. The ideal gift for the man who loves traditional wet shaving. If you can’t decide, why not choose a gift certificate and let dad pick his own favorite Bumble & Co. grooming goods. If you are looking for beautiful natural skincare gift ideas for Mother’s Day, we’ve got you covered! 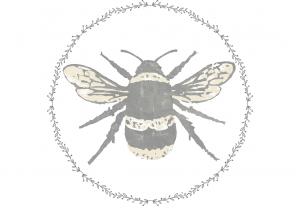 Bumble & Co. is pleased to present a range of indulgent natural skincare products perfect for spoiling mothers of all ages. You’ll find products to pamper + protect, products to hydrate + rejuvenate, and most importantly, products to show mom just how special she is. Natural Skincare Gift Ideas for Mother’s Day! While our products make wonderful gifts for mom, we’ve got a special treat for you too! We’ve got an amazing offer which we are running from now until May 9th (ends 12:00 PST). This is a one-time offer which offers a big saving, allowing you to purchase more Bumble & Co. products to create a special gift collection to really pamper mom (or why not use the savings to buy a treat for yourself?!?). You’ll find a gorgeous hand-selected collection of some of our most beloved products just for Mother’s Day here : Mother’s Day Gifts. Why Gift Natural Skincare Products for Mother’s Day? 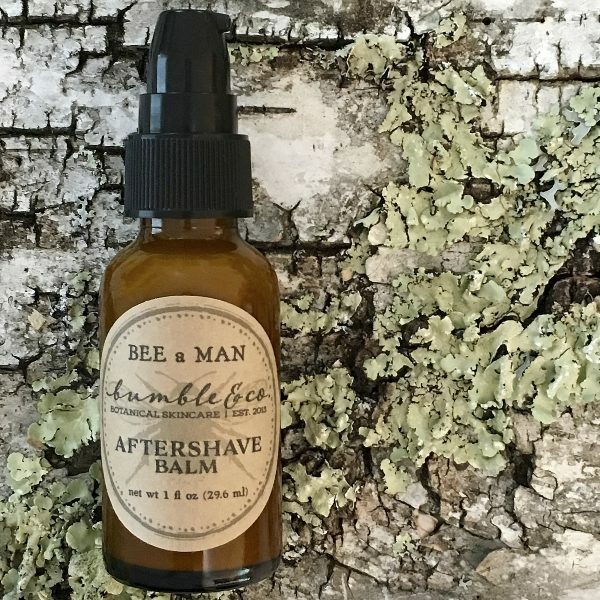 Natural skincare products are a thoughtful gift to give on Mother’s Day. Whether you are giving gifts to your own Mother or celebrating another special lady in your life, giving skincare gifts which you know have been carefully formulated and created using the finest of natural ingredients will be much appreciated. 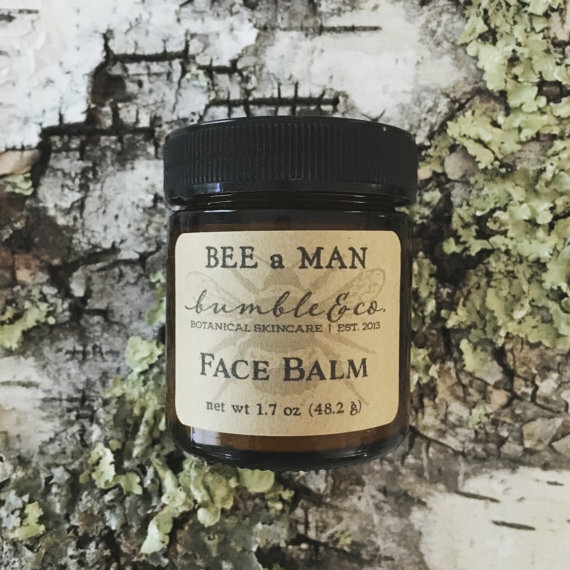 You know that the skincare you buy from Bumble & Co are gentle on the skin and don’t use harsh chemicals. We make all of our products in tiny batches, to ensure that each batch is of the highest quality. Most of our products are suitable for all skin types. If in doubt about ingredients and whether they are suitable for certain skin types, get in touch and we’ll gladly help you decide. When giving our products as gifts, why not try a selection of smaller sized items so mom can experience a range of products? This is a lovely way to create a skin-pampering gift set. Complement our natural skin care products with natural packaging. Some natural brown kraft or butcher paper with a hemp string tie is a simple yet naturally lovely way to present gifts. If you’re unsure of which products choose, consider purchasing a gift certificate instead. This allows the lucky lady to choose the products she loves the most. 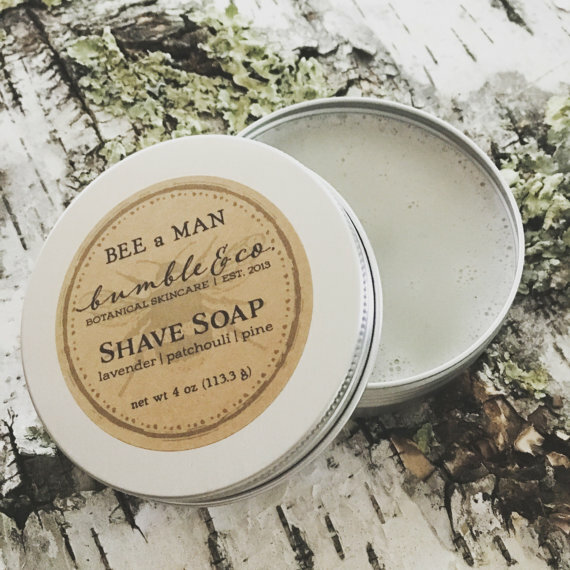 Sign up to our newsletter and be the first to hear the latest buzz on new products, special offers and more from Bumble & Co.